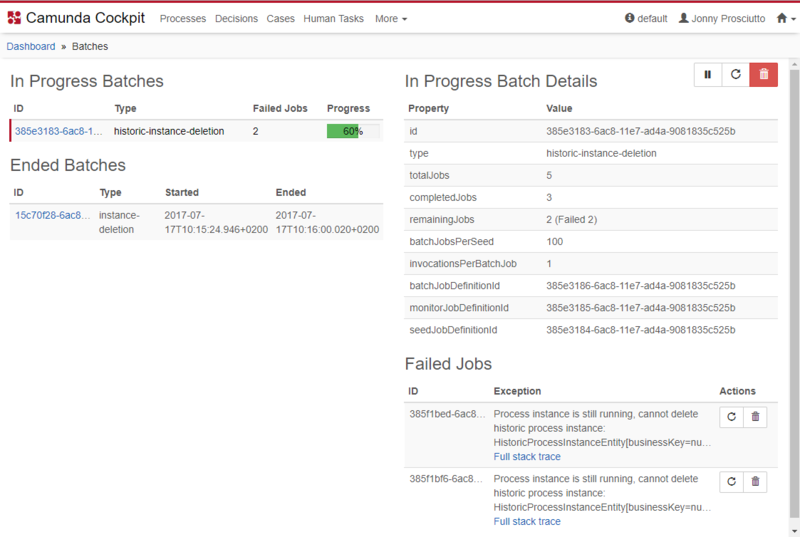 The batch page displays the status of running and completed batches. It allows displaying details of a batch such as the start- and end-time or the number of remaining jobs. For failed jobs, it displays the error message and allows a retry or deletion of the job. On the left side of the page, a list of running and finished batches is displayed. You can click on any entry to display details of the batch on the right side of the page. For batches that are currently in progress, the ID, type, number of failed jobs as well as the progress is displayed. Please note that if a batch has failed jobs, the batch cannot be completed. You have to go to the details view of the batch and resolve the failed jobs (i.e., retrying or deleting them). Also, it can take some time after the progress is at 100% for the batch to actually finish. See the process engine section for details. Below the currently running batches, completed batches along with their start- and end-time are displayed. Completed batches are only visible when the process engine history level is set to FULL. button above the details table. button above the details table deletes a running batch.